We are thrilled to announce that the winner of the 2018 Amaryllis Photo Festival is Avery Soll from Sexsmith, Alberta. His picture (shown to the left) received the most votes (144 votes!) 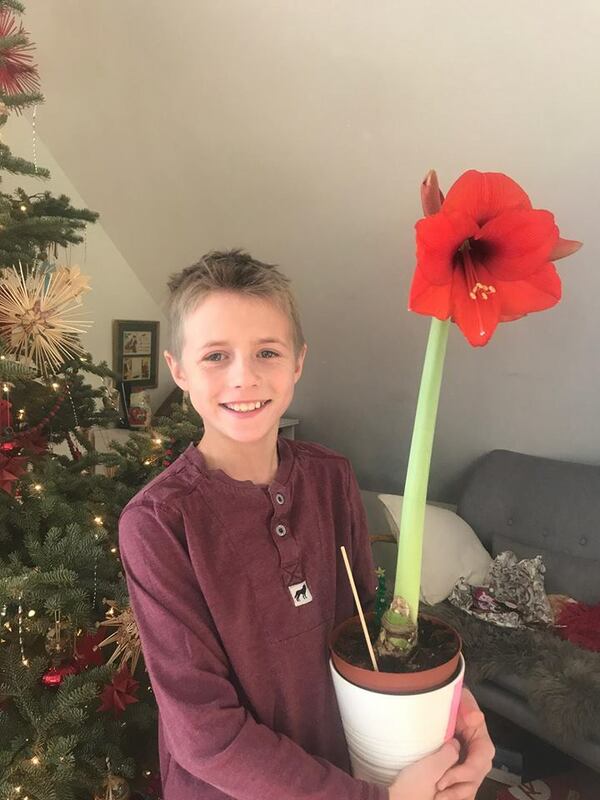 and will be displayed on our webpage for the 2019 Amaryllis Campaign. He will also receive Julie Lawson Timmer’s sensational book Five Days Left as well as an HSC swag bag. This wraps up the 2018 Amaryllis Campaign! Thanks to each of you who participated actively in this year’s campaign. Together, we were able to raise over $120,000 to fund services for individuals and families affected by Huntington disease and to support research. As part of this campaign, you inspired hope across Canada. We truly could not have achieved this great success without the amazing support of all of our volunteers and sellers. Stay tuned for information about the 2019 campaign!